This elaborate and finely carved wooden shrine housed ancestral tablets. It sat on the family altar table in the home. It has two folding main doors fabulously carved with twelve panels of Taoist scenes of emperors, horsemen, pagodas, and pavilions amid conifers, bamboo and other foliage. There are two plain doors to either side. 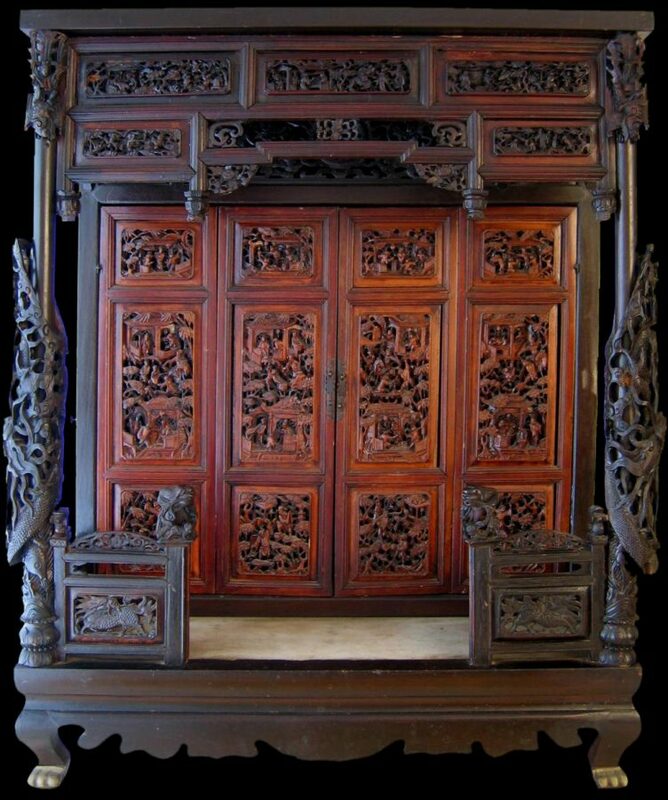 The lintel over the double doors incorporates three carved panels of bats, squirrels, scrolling and a central circular shu (prosperity) emblem. A front portico is marked out by a veranda-style roof and two carved front railings that incorporate open-carved panels of dragons, each end of which is topped by a carved qilin-type figure. To either side are columns finely carved with multiple lotus petal roundels, then fish, above which are movable carved dragons which are entwined around the remainder of the columns. The frontpiece over the portico comprises a further five carved panels of epic scenes and additional carvings of blossoms, lanterns, scrollwork and two deities astride birds. The shrine stands on four zoomorphic feet capped in brass and has a solid marble base. As with most such intricately carved altar shrines, there are some losses commensurate with age and use, but these are largely to the two side carved panels which are not visible from the front. The shrine is finished in a fine shellac varnish which appears to be mostly original. A basic household altar comprised an altar table, ancestral tablets or images of ancestors, and offerings. Wealthier families supplemented the altar with a shrine such as this one. The ancestral spirits were felt to dwell in the ancestral tablets placed in the shrine rather than in the shrine itself and so once the tablets are removed, little superstition attaches to the shrine. Most probably this shrine was exported from China to one of the Straits Settlements in Malaya for use by the local Chinese communities. A similar example is on display in Singapore’s Baba House Museum in Neil Road. The House is one of the few peranakan houses in Singapore still in its original condition.